I’ve been a longtime user of Adaptec SATA RAID cards (3805, 5805, 51245), but over the years I’ve become more energy saving conscious, and the Adaptec controllers did not support Windows power management. My workstations are normally running in the “Balanced” power mode so that they will go to sleep after an hour, but sometimes I need to run computationally intensive tasks that leaves the machines running 24/7. During these periods the disks don’t need to be on and I want the disks to spin down, like they would had they been directly connected and not in a RAID configuration. I was building a new system with 4 drives in RAID10, and I decided to the try a 3Ware / AMCC SATA 9690SA-4I RAID controller. Their sales support confirmed that the card does support native Windows power management. I also ordered a battery backup unit with the card, and my first impressions of installing the battery backup unit was less than impressive. The BBU comes with 4 plastic screws with pillars, but the 9690SA card only had one mounting hole. After inserting the BBU in the IDC header I had to pull it back out and adjust it so that it would align properly. After running the card for a few hours I started getting battery overheating warnings. The BBU comes with an extension cable, and I had to use the extension cable and mount the battery away from the controller board. After making this adjustment the BBU seemed to operate at normal temperature. Getting back to installation, the 3Ware BIOS utility is very rudimentary (compared to Adaptec), I later found out that the 3Ware Disk Manager 2 (3DM2) utility is not much better. The BIOS only allowed you to create one boot volume, and the rest of the disk space was automatically allocated. The BIOS also only supports INT13 booting from the boot volume. I installed Vista Ultimate x64 on the boot volume, and used the other of the volume for data. I also installed the 3DM2 management utility, and the client tray alerting application. The client utility does not work on Vista because it requires elevation, and elevation s not allowed for auto start items. The 3DM2 utility is a web server and you connect using your web browser. At first the lack of management functionality did not bother me, I did not need it, and the drives seemed to perform fine. After a month or so I noticed that I was getting more and more controller reset messages in the eventlog. I contacted 3Ware support, and they told me they see CRC errors and that the fanout cable was probably bad. I replaced the cable, but the problems persisted. The CRC errors reminded me of problems I had with Seagate ES2 drives on other systems, and I updated the firmware in the 4 500 GB Seagate drives I was using. No change, same problem. I needed more disk space anyway, so I decided to upgrade the 500GB Seagate drives to 1TB WD Caviar Black drives. The normal procedure would be to remove the drives one by one, insert the new drive, wait for the array to rebuild, and when all drives have been replaced, to expand the volume. A 3Ware KB article confirmed this operation, but, there was no support for volume expansion, what? In order to expand the volume I would need to boot from DOS, Windows is not supported, run a utility to collect data, send the data to 3Ware, and they would create a custom expansion script for me that I then need to run against the volume to rewrite the META data. They highly recommend that I backup the data before proceeding. I know the Adaptec Storage Manager (ASM) utility does support volume expansion, I’ve used it, it’s easy, it’s a right click in the GUI. I never got to the point of actually trying the expansion procedure. After swapping the last drive I ran a verify, and one of the mirror units would not go past 22%. Support told me to try various things, disable scheduling, enable scheduling, stop the verify, restart the verify. When they eventually told me it seems there are some timeouts, and that the cause was Native Command Queuing (NCQ) and a bad BBU, I decided I had enough. The new Adaptec 5-series cards do support power management, but unlike the 9690SA card they do not support native Windows power management, and requires power savings to be enabled through the ASM utility. I ordered an Adaptec 5445 card, booted my system with the 9690SA still in place from WinPE, made an image backups using Symantec Ghost Solution Suite (SGSS), installed the 5445 card, created new RAID10 volumes, booted from WinPE, restored the images using Ghost, and Vista booted just fine. From past experience I knew that when changing RAID controllers I had to make sure that the Adaptec driver would be ready after swapping the hardware, else the boot will fail. So before I swapped the cards and made the Ghost backup, I used regedit and changed the start type of the “arcsas” driver from disabled to boot. I know that SGSS does have support for driver injection used for bare metal restore, but since the Adaptec driver comes standard with Vista, I just had to enable it. It has only been a few days, but the system is running stable with no errors. Based purely on boot times, I do think the WD WD1001FALS Caviar Black drives are faster than the Seagate ST3500320AS Barracuda drives I used before. Let’s hope things stay this way. The Adaptec was not that power friendly after all. In the ongoing saga to get a motherboard that works well with Vista SP1 going to sleep, I have yet again switched motherboards. As previously posted I’ve tried an Intel DG33TL board, and an Intel DQ35JO, and I am now using an Asus P5E-VM HDMI board. I was happy with the Intel DQ35JO, but this did not last very long. A few days after posting I found my machine with garbage characters on the screen, requiring a cold boot. Intel support was of little help, but a few days later I updated the firmware on my ThinkPad T61, and I read that one of the fixes in the firmware was to fix garbage characters on the screen when sleeping on resuming from sleep caused by the AMT feature. The DQ35JO board also has AMT, so maybe that was the same problem. Not wanting to have more trouble I returned the Intel DQ35JO board to Fry’s, and I ordered an Asus P5E-VM HDMI board from Amazon. There are three variants of the P5E-VM board; the SE, DO, and HDMI, but only the HDMI variant was immediately available on Amazon. I would not be using the HDMI output since I was going to use the ATI HD 2600 XT card, but it does not hurt to have onboard HDMI available. Installing the board was simple, the RAID still worked, and Vista Ultimate x64 booted without issues. The only missing driver was for the Realtek audio. I tried the driver from the Asus site but that failed to install, rather disappointing. Asus support told me to use the driver from the Realtek site, and that worked fine. I again noticed that the power LED was intermittently not working, this being the third board with this problem, I was now convinced it was a problem with the actual LED. I contact Antec support, and a few days later I received a new power LED free of charge. I installed it, and problem solved. Asus provides several utilities to monitor and adjust the performance of their boards, i.e. AI Suite and PC Probe II. I’ll spare you the details but these utilities are of very poor quality, failing to install, failing to uninstall, crashing on start, crashing on sleep, crashing on resume from sleep, and worse when uninstalled they still leave crap behind. I had to delete two tasks from the task scheduler, delete several files and folders, and manually delete several COM objects from the registry. Avoid these tools. One feature I really like about the Asus board is the BIOS upgrade feature. Just copy the firmware to a USB key, plug the USB key in, boot, enter the BIOS, select the upgrade option, pick the file, and upgrade, so simple. This time round I waited a few weeks before posting, and I am very happy with the Asus P5E-VM board. here, I purchased two Intel DG33TL motherboards. and by adding an ADD2 HDMI board you get HDMI and audio over HDMI. Intel ADD2 HDMI card support. Vista installed very fast and with no problems. reboot and continue the installation after every driver. website lists the latest driver as 6.x. incorrectly listing the 6.x driver as compatible with this board. and lists one source for a voltage reading as unknown. BIOS and the Desktop Utilities, made no difference. Media Engine, but this made no difference. there is a HDMI signal, but no picture on the television. television, and digital television, only monitor / VGA works. the machine blue screen crashes when going to sleep. install of Vista Ultimate x64 with integrated SP1. I urge you to contact Intel support and notify Intel of the problems. version of Desktop Utilities to solve the 0.000V alerts. the 5.x driver, seems the 6.x driver was not supposed to be on the site. I have not been able to get HDMI working with the Prolink card. “G965 with Prolink HDMI ADD2” post on AVSForum. I purchased an Antec Fusion Black case to replace my aging HTPC. The case looks very nice. For such an expensive case this is rather disappointing. but hard drives are located in an area with no direct ventilation. seen if the drives will overheat or not. The LCD turns on bright blue when power is applied to the case. enabled to turn the LCD off. The LCD contrast is very poor, and the viewing angle is severely limit. sources obscure the display contents. the LCD of my Yamaha RX-V2700 receiver. moment the iMON software starts the flickering starts. text is now readable at the medium contrast setting, but not nearly as good as the picture from the iMON website. and log in using only the navigation buttons on the remote. the display. Once this happens you ave to unplug the case and reboot. this thread on the SoundGraph forum. that is not satisfied to contact Antec and raise your concerns. Due to the poor LCD image quality and various other issues I do not recommend this case. models appear to have very good image quality and good features. I bought a Philips 9″ wood border model 9FF2CWO. The frame looks very nice. The image quality is really very good. The frame’s built in software is very extensive and easy to use. to memory cards, no special settings required, no image resizing required. links to the documentation or the Photo Manager installation does nothing. On launching the autorun application again the links now work. removable media slots in the frame. The Photo Manager software (picture) leaves much to be desired. 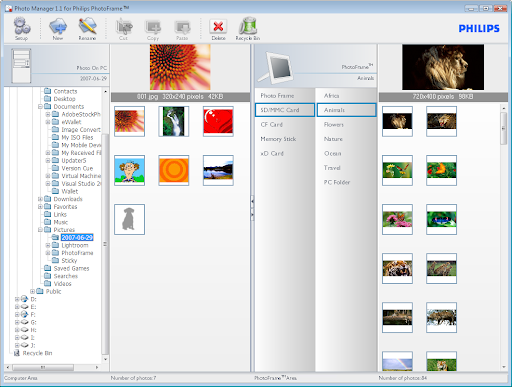 software, or to delete the pictures directly using Windows Explorer. listed on the Philips support website.